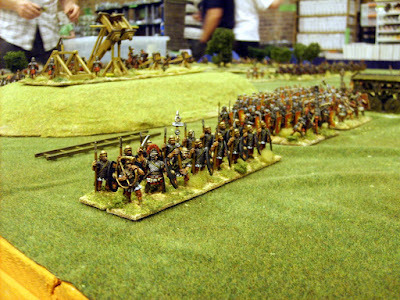 The Club hosted a demo game at Phalanx down in St Helens. A replay of the May Day game, but with all the forces already on the table, which now looked much better with the green flocked GW mats rather than bedsheets. Was a nice drive down with little traffic or roadworks and managed to get a decent parking space. Think I managed to avoid the speed trap on the road in. Martin was already down St Helens, and Matt and Alan brought their stuff down in the Morning. When I got there it was just about opening time. Having studied the hieroglyphs scrawled on players campaign sheets, I have arrived at the following conclusions in the great Irish uncivil war:1099. There are 60 towns and castles available to nab, 3 more belong to the nasty Normans. (or people calling themselves Norman, everyone's too scared to ask which). A High King has to control (directly or through vassals) two thirds to win . i.e. 40. Some more historic stuff from 2006, this was the ongoing Irish Clans Campaign organised by Paul. The battles being fought out using quick play rules so two or three being played per club night. 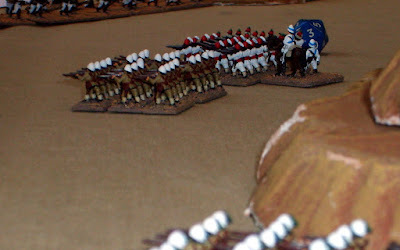 An earlier version of the posts appears on the Furness Wargamers site. Each player started with 3 Clan\Family Leaders each with a clan force and two locations (6 in total) The actual clans representing pseudo-historical families (with certain name changes!). Alliances could be made and were binding till broken! The first outing for my newly nearly finished Italo-Abyssinian War figures (For the First War in the 1890's not the pre-WW2 Second War). 15mm based for Principles of War, mixture of Irregular (bulk of the Abyssinians), Tin Soldier UK (Most of the Italians and leaders on both sides) with a few Essex thrown in. A simple straight up fight. 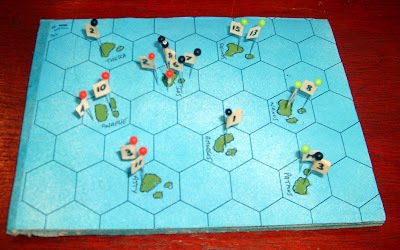 Order of Battles were based on the lists in the PoW Colonial supplement. 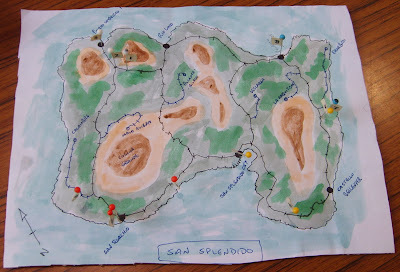 A mini-campaign set on the island of San Splendido, located in an undisclosed location near the Caribbean. Rules are a version of G.E.V. adopted to modern warfare. 4 player led factions fighting over the 6 cities and 6 villages on the map. Blue pins are Paul, Yellow are Tony, Red are Dave M, and White is me.